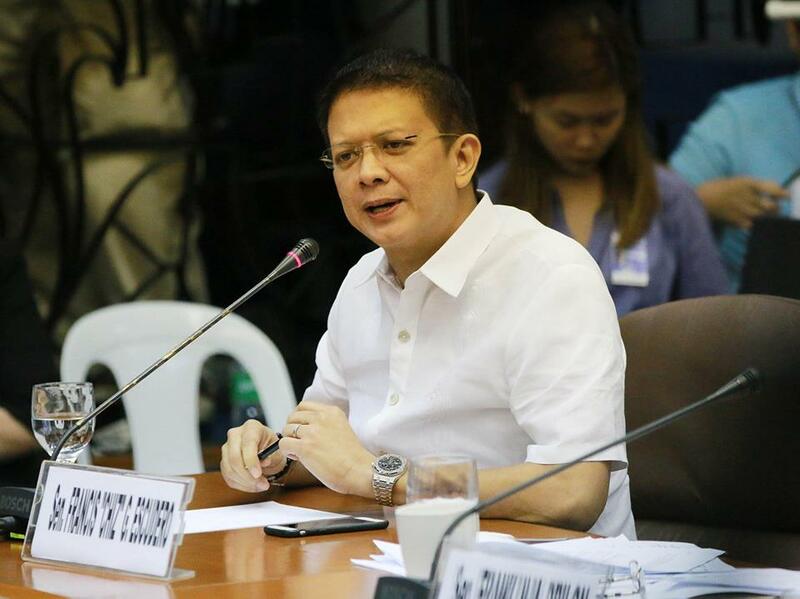 MANILA, Philippines - Senator Francis Escudero continues to lead in the May 2016 vice-presidential race survey while three other VP bets have double-digit voter preferences, Pulse Asia announced on Saturday, February 6. Thirty-three percent (33%) of Filipino registered voters said they would elect Escudero to the vice presidency if the 2016 elections were held at that time. Meanwhile, Senator Ferdinand R. Marcos Jr. secured second place with 23%. Camarines Sur Representative Maria Leonor "Leni" G. Robredo and Senator Alan Peter S. Cayetano shared third spot (18% and 14%, respectively). Two other candidates posted single-digit voter preferences – Senator Gregorio Honasan (5%) and Senator Antonio Trillanes IV (4%). 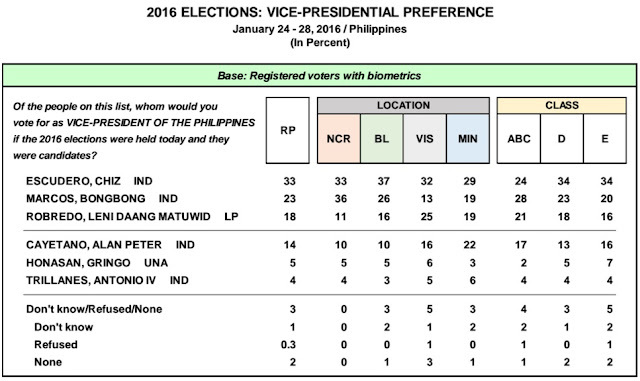 The rest of Filipino registered voters (3%) do not have any preferred candidate for vice-president. The survey which was conducted from January 24 – 28, 2016 using face-to-face interviews has confidence level at 95 percent. In the different geographic areas and socio-economic classes, Senator Escudero has the lead in the rest of Luzon (37%) and Classes D and E (both at 34%). 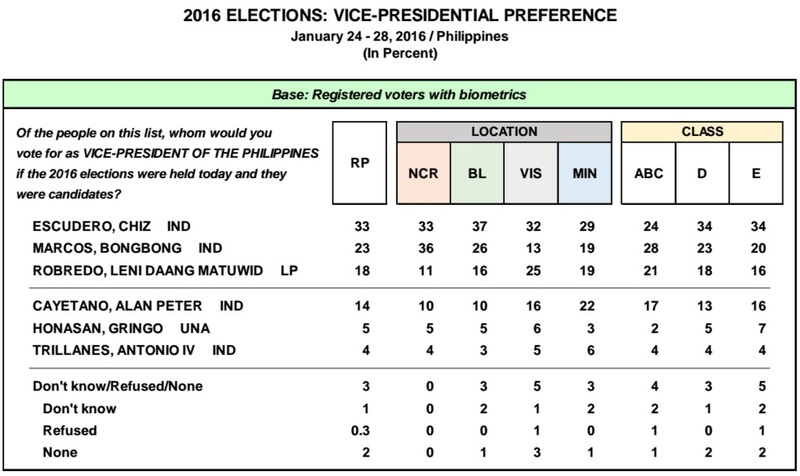 Metro Manila residents are most inclined to vote for either Senator Marcos (36%) or Senator Escudero (33%). In the Visayas, the lead is shared by Senator Escudero (32%) and Camarines Sur Representative Robredo (25%) while in Mindanao, the top candidates are Senator Escudero (29%) and Senator Cayetano (22%). As for those in Class ABC, their most favored vice-presidential bets are Senator Marcos (28%), Senator Escudero (24%), Camarines Sur Representative Robredo (21%), and Senator Cayetano (17%). Pulse Asia said that the levels of support for these six vice-presidential candidates do not move significantly during the period December 2015 to January 2016. This observation holds true at the national level and across geographic areas and socio-economic groupings.